For 138 years, Dentons' presence in San Diego has been a vital part of business and civic life. Operating out of its downtown and La Jolla offices, Dentons’ lawyers provide comprehensive legal counsel to a broad spectrum of businesses, including startup ventures, closely held firms, publicly traded companies and multinational corporations headquartered in Southern California, the U.S. and across the globe. 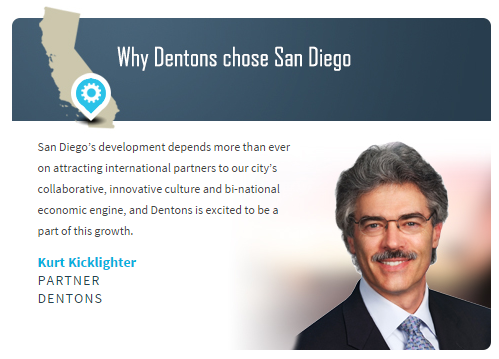 This week, we talked with Kurt Kicklighter about why San Diego’s innovative culture matters to Dentons. On July 1, 2015, Dentons US and McKenna Long & Aldridge merged, expanding Dentons’ geographic reach and strengthening our talent base in the U.S. Dentons offers clients the full range of business and dispute resolution services through approximately 3,000 lawyers and professionals, 1,100 of whom are located in the U.S., delivering integrated, multidisciplinary cross-border solutions at any one of our 80-plus locations in 50-plus countries. Dentons is driven to provide a competitive edge in an increasingly complex and interconnected world. A top 20 firm on the Acritas 2014 Global Elite Brand Index, we are committed to challenging the status quo in delivering consistent and uncompromising quality in new and inventive ways. With a legacy of legal experience that dates back to 1742 and builds on the strengths of our foundational firms—Salans, Fraser Milner Casgrain (FMC), SNR Denton and McKenna Long & Aldridge—the Firm serves the local, regional and global needs of private and public clients. Dentons is a polycentric firm with no dominant national culture or single headquarters. This approach benefits our clients as they compete in their particular industries and in global markets, providing legal talent from diverse backgrounds regardless of geography. While this polycentric approach may sound like some futuristic vision, it is happening today—in San Diego and elsewhere. Marketplaces that were out of reach only a few years ago are today eager to have San Diego usher in this new era of commerce. Witness, for example, how quickly our city’s biotech sector has blossomed in a relatively short time period. According to a recent study, nearly 450 technology and life sciences startups were founded in San Diego just last year. These companies emerge here and quickly flourish on the international scene. 3) What do you anticipate for your company in five years? What do you anticipate for San Diego? Earlier this year, the Firm launched NextLaw Labs—a collaborative innovation platform focused on investing in, developing, and deploying new technologies to transform the practice of law and benefit our clients—and we continue to find timely, innovative and practical solutions to get a deal done or a dispute resolved. As our clients’ business changes, we change ours as well. San Diego’s development depends more than ever on attracting international partners to our city’s collaborative, innovative culture and bi-national economic engine, and Dentons is excited to be a part of this growth.